We often talk at Dot Org about how we communicate with our customers and constituents and how it is always changing. So, during this conference, it was certainly helpful to learn more about the intricacies of inbound marketing, lead generation, sales and other topics that are relevant to our clients and to our own business. The sessions I attended focused mainly on how inbound marketing applies in the for-profit sector. But, I soon found many ways that nonprofits can use the same principles to communicate more effectively with clients and donors. Before I share some tips on how inbound marketing is important to nonprofits, it is important to define exactly what “inbound” means. Simply, inbound marketing is the use of content, social media, websites and other communications platforms to deliver value, build trust and drive consumers to a company or organization. Nonprofits, by their very nature, are in a position where trust is critical to their mission. And many nonprofits, whether they realize it or not, are doing some inbound marketing – and doing it well. Unlike many for-profit companies, nonprofits have a wide range of consumers – clients, patients, donors, volunteers, audience members and prospective employees – that have radically different motivations for interacting with the organization. And there are often limited resources in which to communicate or deliver content to all of them. Thinking about and building an inbound strategy can be overwhelming for a nonprofit. 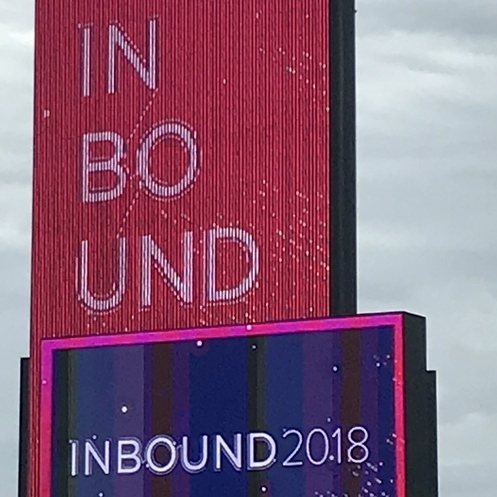 But there are some things I learned at #Inbound2018 that are applicable to the nonprofit sector, keeping in mind limited personnel and financial resources. A buyer’s journey is 70 percent digital, meaning that when someone is researching your organization, they spend about 70 percent of their time learning about you online. And 70 percent customers want their problems solved – not to be sold to. Think about what your consumers are searching for and create content that they are looking for. You may want to ask your receptionist for some of the most common questions he/she gets on a daily basis. Don’t just push events or provide generic information. Give visitors something they value. This was a great quote from Emil Everett of New Amsterdam in his “100+ Ways to Differentiate” session. Many nonprofit websites, emails and letters don’t have a clear message. And that often comes from the fact that even those who work for the organization don’t understand the message. If you find people frequently asking you to explain what you do, then you have a messaging issue. Clearly explain who you are, what you need and how you provide value or demonstrated need to your consumers. A good content calendar includes dates, audiences and topics for the following: website updates, social postings, blog writings, e-newsletters, direct mail and other planned communications. Having this calendar helps your team understand what is going out when, manage its resources and know when different audiences receive information. It is also helpful for creating consistency in case of staff turnover. Just because you’ve used a piece of content once doesn’t mean you cannot use it again. In fact, the repetition is a good thing. Repurpose a blog post at a different time of year. Post portions of your e-newsletter on social media. Take an article from a magazine and include it in an e-newsletter with a link to the full publication. There are many ways to use the same content for different audiences. It saves you time AND money. Google is constantly changing its algorithm for search. But that doesn’t mean keywords and SEO are dead. However, you can’t write just for key words. In his session, Everett Ackerman of New Breed Marketing talked about how one piece of content can rank for a range of keywords. So, it is important that the focus of content should be on quality, not quantity, in order to have better search rankings. Nonprofits have a wide range of audiences – clients, donors, volunteers, partners, employees – and each may have a radically different persona. In order to build the trust we talked about earlier, spend time developing personas and determine their goals when searching for information on your website or other content. Are they trying to learn more about how to work with your organization? Are they trying to get certain information? Are they trying to use your services or make a gift? Knowing the answers to these questions will help you shape content. I thank Gray Mackenzie of Guavabox for this one. In a world where we have so much information coming at us all the time, the last thing we need is to have content (web, e-news, video, social or otherwise) that makes us work too hard to get the information we need. Simplify the visitor’s journey. Eliminate unnecessary clicks on the website, push content that people want to read, and give people opportunities to easily connect with you. Inbound can be overwhelming, even for those with a team of experienced professionals. If you’re a nonprofit marketing professional, you may be the only person doing content, so it is really a challenge. Try to accomplish one or two things that you can manage. Reserve some time each week to focus on a small change to your content. Add a call to action to your website pages. Repurpose a piece of content, or start to build your content calendar by just simply writing down what you did that week. The more you focus your content, the more you will stand out in the crowd. And you will deliver value and build that trust that will benefit your nonprofit on many levels. Want to learn more about how to build an inbound strategy for your nonprofit? Contact us at [email protected].